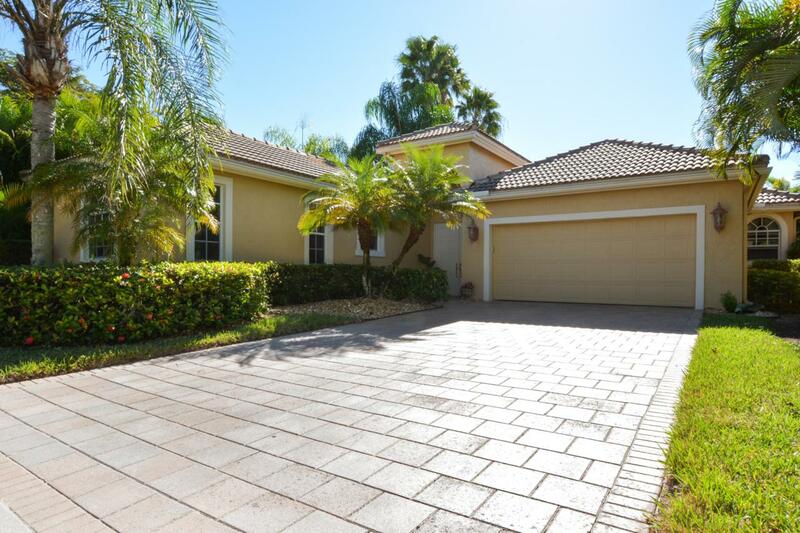 **Must buy available membership to live in Wycliffe Golf & Country Club located in Wellington,Florida; This Courtyard home w/pool & separate 710 sf large apartment style Guest House, 2 patios, 3 bedroom, 4.5 bath plus office/den could be 4th bedroom,custom-built open floor plan, crown moldings, volume and tray ceilings, Clerestory windows, French doors to spacious, covered private pool/patio areas, 14' ceilings in living areas, granite kitchen, large master bedroom suite w/engineered flooring,with sitting area, his and hers granite bathrooms and his and hers walk-in closets (3)total. Master bathroom is fitted with roman tub, large corner shower, separate commode and spacious vanity with make-up station. grsmgt.com/association/greenbriar-at-wycliffeWycliffe Golf & Country Club is located in Wellington,FL Courtyard home w/pool & 710 sf large apartment/separate style Guest House, *membership/Golf 26,000, Initiation 30,000, annual dues 12,003, 1 time cap reserve $1,200, Reno $120 monthly *Exterior just painted*, 2 patios, 3 bedroom, 4.5 bath-office could be 4th bedroom,custom-built open floor plan, crown moldings, volume and tray ceilings, Clerestory windows, French doors to spacious, covered private pool/patio areas, 14' ceilings in living areas, granite kitchen, large master bedroom suite with sitting area, his and hers granite bathrooms and his and hers walk-in closets (3). The ladies bathroom is fitted with roman tub, large corner shower, separate commode and spacious vanity with make-up station. Open floor plan living areas feature custom-built floor-to-ceiling family room media center/storage constructed from hardwoods with wood burl inserts and cast stone columns and a Tuscan-design custom-built bar with gorgeous orange-onyx stone surfaces. The granite kitchen features premium Whirlpool appliances and plenty of surface and cabinet space. The den/office features custom-built floor-to-ceiling mica and wood built -in with media armoire, desk and credenza modules featuring large work surfaces and lots of storage. A large guest bedroom, sharing a Jack and Jill full bath with the office/den, powder room with artist-created trompe l'oeil mural and large laundry room with sink, complete the main house. A unique and very desirable feature of this home is the over-sized detached guest house. Measuring a spacious 710 sq. feet, this full-featured apartment has large (16 X 16) bedroom w/engineered flooring, dine-in kitchen and large living room/office area overlooking the pool. The guest house carries over the professional dcor from the main house and features granite in both the kitchen and bath areas. A decorator-tiled bath with spacious walk-in shower completes the spacious and inviting quest quarters. The two-car garage is an extended in depth, allows room for golf cart and features lots of storage, cabinetry and shelf space. The pool/patio area features a 15 X 30 Diamonbrite pool and lions head water feature and covered outdoor living space. The home's robust electrical/mechanical features include three separate air conditioning units, three water heaters and 200 amp. electrical service. Wycliffe Golf & Country Club Is A Mandatory Membership Club Offering The Best Lifestyle In South Florida. Featuring 2 Dining Venues, State Of The Art Fitness Center, Palates, Aerobics, Yoga, Spin, Fitness Classes, Water Aerobics, Personal Trainers, Physical Therapy, Sauna, Steam, 16 Har-Tru Tennis Courts With A Center Court Stadium Seating, Two Championship Golf Courses, Olympic Size Swimming Pool/Spa, Full Service Spa, Ladies/Men's Card Rooms, library, Clubs And Organizations, Special Social Events, Dinner Dances. Come Join The Fun, This Wonderful Home And Country Club is located in the heart of Wellington, Florida, known for hosting the annual Winter Equestrian Events, just West of Wycliffe. Just 20 minutes from the Palm Beach International airport, Boca Raton and Palm Beach Gardens and West Palm Beach and 12 miles to the Atlantic Ocean.